On Monday, both the Porsche 911 GT2 RS and Forza Motorsport 7 made their concurrent debuts at the Microsoft conference of E3. The trailer for the biennial racing game's newest iteration focused on subtle showings of new features to be included in the upcoming title—the least of which is a background of fully animated camels. While the new Dubai circuit, the inclusion of Forza Horizon 3's widebody options, and allusions to the ability to customize your driver's appearance are neat, they are just the vegetables in the larger context of the meal that is the game's announcement—and we have the meat of the news. The first and most important piece of news is in regards to the game's online multiplayer, where most of the game's following spends the majority of its time. Since the early days of multiplayer racing games, other players have always been the number one source of frustration—between players who think that every chicane is a shortcut rather than a corner and those who would rather slow down using your rear bumper as a brake instead of their own pedals. According to information attained in an exclusive and closed-doors session, Forza Motorsport 7 will have a penalty system in which dirty players and bad sports who set out to ruin the fun of others will be taken down a notch, with time penalties handed out for infractions. Given that most poor players already care little about where they finish, more may need to be done to guarantee a sportsmanlike environment, though there is no confirmation that punitive measure will be limited to time penalties. When it comes to track selection, some fan favorite locations are returning, as well as some new locales. Fan favorites Maple Valley, Suzuka, and Mugello, absent after Forza Motorsport 4, will return. The only known new addition is the Dubai track from the trailer. The official blurb advertises "over 30" track environments, and considering Forza Motorsport 6 contains 28, there may be no more than the current known roster of tracks. There is a small selection of bonus content available parallel to the game's release. 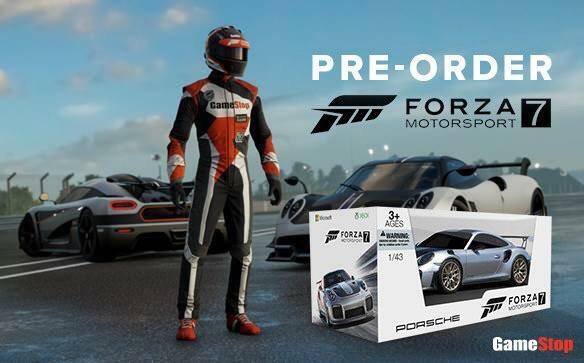 Pre-orders from GameStop are coming with a die cast model of the game's cover car, the 911 GT2 RS. Totino's will be offering both a prize drawing and, potentially, codes for additional cars, much like Forza Horizon featured a Pizza Hut-themed Boss 302 Mustang. The game will be released as a part of three different packages: Standard, Deluxe, and Ultimate. Standard will come only with the game, whereas Deluxe and Ultimate buyers will receive the Day One Car Pack, VIP Membership, which grants access to five cars and periodic gifts from Turn 10, plus all pre-order bonus content available for FM7 and Forza Horizon 3. Ultimate also has the Car Pass, which is a season pass for the first several car pack DLCs to be released. Digital buyers of the Ultimate edition will receive early access to the game, on September 29th. The game itself launches October 3rd. Which racing game's trailer will give you more goosebumps?